Size: 585 sq.ft. - 744 sq.ft. Bhavya Enclave was launched recently in May 2018. 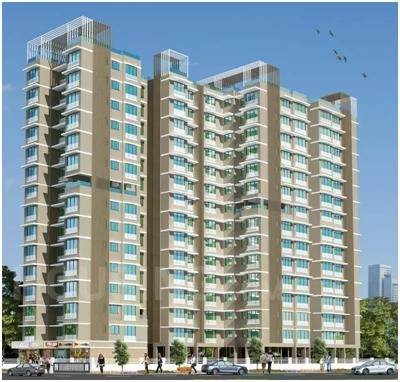 It is a configuration of standalone tower over 0.62 Acres land consisting 15 storeys. The Enclave property is registered under MAHA RERA No. P51900013855. The Vakola Enclave is a very demanding residential project which is being presented by the reputed architects. This small master piece has been elegantly conceptualized and perfectly planned keeping in mind the needs of modern middle-class families who love to spend their time and life in a sober place. The Enclave houses priced from 1.87 Cr to 2.38 Cr. The completion date is of this property is expected by June 2019. Bhavya Enclave comes with only one choice of homes with different carpet area sizes differs from 585 sqft to 630 sqft to 637 sqft to 647 sqft to 744 sqft. In total there will be approx 54 unfurnished units with 50% open space around the tower. The project is completely equipped with the benefits of ultra-modern amenities, facilities & other various features. The Bhavya Enclave offering you a comfortable way of changing your living lifestyle by blending each home with beauty and harmony. The project concept may be too small but there is optimal use of space, planning with good lighting & cross-ventilation. Bhavya Buildtech Group of Companies is operational since 1998 and is known as one of the trusted construction companies in Mumbai. The group wants to be the most preferred choice by the customer. Their work is being appreciated by every customer from different cities. Bhavya Group's aim is to create and maintain reward winning projects that attract all kind of customers with the help of their most talented workers who contribute their competencies towards the development of the Bhavya real-estate group. The landmark projects by Bhavya builders:- Buildtech Bhavya Heights in Kandivali West & Ratna Deep in Tilak Nagar. The group has hired well educated engineers and the professional team to take the company into right direction. Vakola is known as a suburb of Santacruz East, Mumbai. It is a well-developed locality in the neighbourhood of Ashok Nagar, Kalina and Hanuman Tekdi. The prices of property in Vakola village are very high from the last couple of years. Within 20-25 minutes of distance you can easily get to Chhatrapati Shivaji International Airport, Santacruz Station, Western Expressway, Ville Parle Station and Andheri Metro Station. The locality also has many residential properties designed by world famous developers and offering unlimited range of homes to home buyers & investors. As this destination fulfills all your necessary daily utilities that have boost the growth of housing property. The Enclave tower by Bhavya Group lies in Mathuradas Colony at Vakola Village, Santacruz East, Mumbai, Maharashtra – 400052. Bhavya Enclave at Santacruz East is loaded with world class facilities and those are Sewage Treatment Plant, lifts, Rain Water Harvesting, kids play area, visitor's parking, golf course, club house, Car Parking area, swimming pool, jogging track, gymnasium, Street Lights within the community and other necessary amenities to be develop soon. Schools/Colleges – St. Charles Girls' School, St Anthony's Boys' School,Kalina Municipal School, Mumbai University. Hospitals – Niron Hospital, Dr.Sherekars Hospital, The G Clinic, Durga Nursing Home & ICU, Surya Hospital. Pharmacies – Jupiter Medical store, Campus Medical Store, Dinesh Medical store and Kalina Medical Store. Bank/ATM(s) – The Bharat Co-operative Bank & ATM, Kotak Mahindra Bank, Bank of Baroda ATM. Park/Garden(s) – Dinkar Patel Garden, Ocean Garden, Joggers Park. Shopping Malls – Kohinoor City Mall, Milan Mall, Neptune Magnet Mall, Link Square Mall, Hi! Life Mall. Movie Theatres – Akash Cinema andKalpana Cinema Hall. Railway Stations – Santacruz Railway Station, Bandra Terminus, Khar Railway Station, Vile Parle. 617 sq.ft. - 976 sq.ft.